When shooting motion picture film, cost is always a concern as film flies through the camera. Not surprising, the 17.5mm format started out as an inexpensive alternative to 35mm motion picture film -- 35mm film was just split in two. The 17.5mm motion picture format was known in France well before World War II and was called Pathe Rural. Pathe Rural was intented for rural areas, with no permanent theater, and was more economical than regular 35 mm. It was not long before still cameras were designed to use the readily available 35mm and 17.5mm motion picture films. But there are many cameras that come close to this definition, so what is and isn't a HIT varies from person to person. Would a camera that meets all of these criteria, but uses 16mm film qualitfy as a HIT? Or how about a camera with two shutter speeds? Or one with a variable aperture? 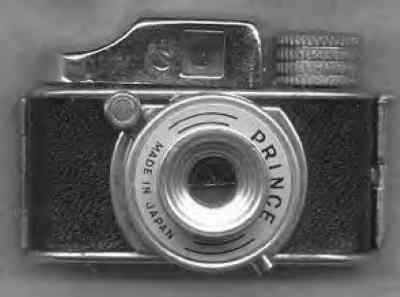 HIT cameras were definitely a hit when they appeared on the Japanese market just after the end of World War II. 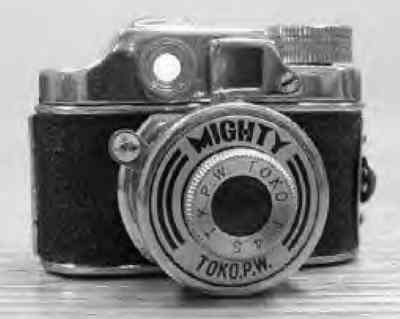 The reason they were designed, and the reason for their popularity, was that cameras, film and processing -- in short, photography -- were horribly expensive in Japan after the Second World War -- in a country that LOVED phtography. Most of their cities had been largely destroyed during the War, and just getting enough food was an enormous challenge and expense. 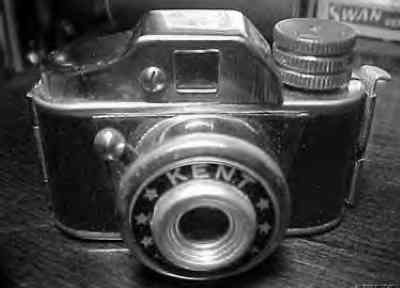 The features and quality of these cameras was not great -- the U.S. market considered them toys -- but they sold well in Japan since they were inexpensive (like denim bean bag chairs did in the 70's in the USA). Most 17.5mm cameras use paper-backed, split, unperforated, 35mm film, keeping costs down. Most are also very simple mechanically and, today, are mainly collected, as opposed to used for their picture quality. While most of these cameras were poor performers, a few produced excellent results with good optics and adjustable features! Just to muddy the photographic waters, these 17.5mm cameras are also sometimes called Mycro (or Micro) or Midget cameras after other common nameplates. The film and format are sometimes called Mycro, as well. Keep in mind that, not all 17.5mm cameras are HIT-type cameras, and not all HIT-type cameras are 17.5mm. Some additional "HIT" cameras that used 16mm film are listed under the 16mm camera section. Hit-type cameras may still be manufactured today in Hong Kong, Singapore and other locations. If you have additional information about new models or more accurate information about those listed here, please contact us. Much like their security cameras counterpart. Even though this list is long, it is inaccurate and incomplete. Much of the information about any particular camera, especially rare cameras, is virtually impossible to find. Sometimes all that is available is very limited information or a photograph of the camera. As a result, details about the camera may be incorrect. 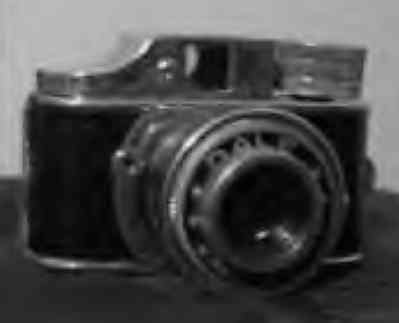 To complicate matters, many cameras were available in different styles with different features. If you are able to provide more accurate information than is listed here, please contact us. -- a "HIT"-type camera. Two speeds, I (1/50) and B. 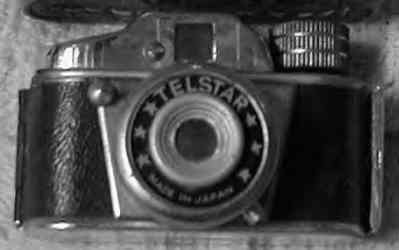 -- an early "HIT"-type camera. We know it's early because it is often marked "Made in Occupied Japan". -- a "HIT"-type camera -- and a very common one at that! -- a "HIT"-type camera. This one is not the same as the Arrow although it is very similar. It says "ARROW-CAMERA" on the front plate. 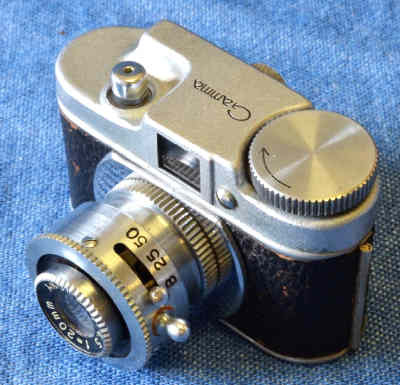 -- a post-war "HIT"-type camera often marked "Made in Occupied Japan". Sports a 20mm lens. 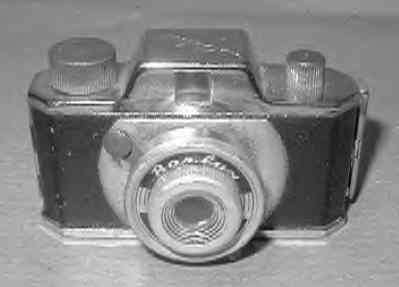 -- (1950) This is a tiny twin lens reflex camera with a pop-up viewfinder. Speeds of B, 1/25 - 1/150. 20mm (f3.5) lens. Several versions were made. Not a quality shooter. Similar to, but not the same as, the Peace Baby Flex. 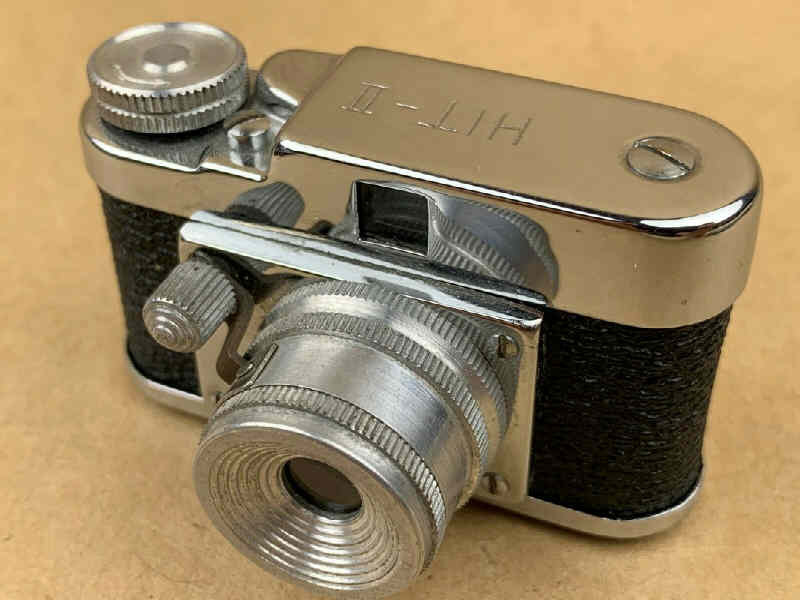 -- (1960) a "HIT"-type camera with a non-focusing, 30mm (fixed f11.0) lens. Single speed. -- a "HIT"-type camera with a fixed-focus lens. Single speed. -- a "HIT"-type camera in most respects. It has a fixed-focus lens and a single speed, but it has an unusual shape for a Hit-type camera. -- (1949) 20mm (f4.5) fixed-focus lens. Speeds of B, 1/25 - 1/100. 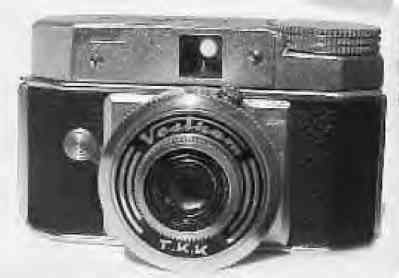 Similar to Vestkam, Meteor and Epochs, but this camera had a dual viewing system. There was the traditional viewfinder, but there was a built-in right-angle, "spy-finder" as well. 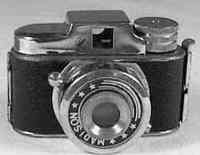 -- (1960) The features were similar to "Hit"-type cameras, but the appearance was more like a tiny rangefinder camera. Fixed-focus lens with a fixed aperture. Single shutter speed. Attractive leatherette covering. Not to be confused with the other Bell cameras that used 16mm film. -- a "HIT"-type camera. Comes with nice pastel colored leather. -- a "HIT"-type camera. Two speeds, I (1/50) and B. Various body and leatherette colors. 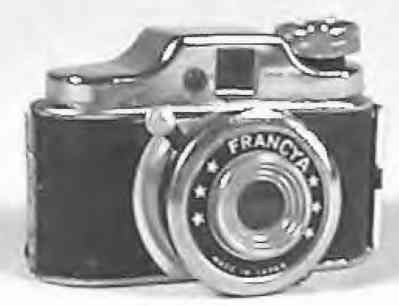 -- (1950) A vertically-styled camera with a fixed-focus f7.0 lens. Viewfinder on top. Speeds of B and I. Film winding lever on the side. -- a better than average Hit-type camera withe a dual viewing system -- eye-level and waist-level. Most definitely not a "HIT"-type camera, but every bit as simple. It is a very simple camera in an all plastic body. 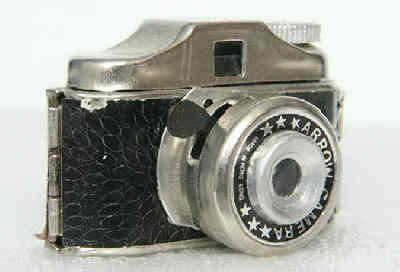 -- a "HIT"-type camera from the late 1960s with a 28mm fixed-focus (f/11) lens and shutter speed of 1/50. -- (1949) 20mm (f3.5) fixed-focus lens. Speeds of B, 1/25 and 1/50. Similar to Beauty 14, Meteor and Vestkam. -- a "HIT"-type camera. Apparently not made by Fuji, but it did have a silhouette of Mt. Fuji on the top of the camera. See also Comex. 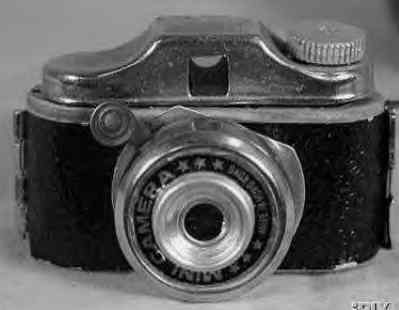 -- one of the earliest 17.5mm cameras -- late 1940's -- the Gamma is shaped more like a tiny 35mm rangefinder than a typical "HIT"-type camera. It is larger than the typical HIT, but not by much. The shutter release is on the camera top, not the lens -- which is a rather long, focusing, Angel 20mm f4.5 optic with f-stops to f9. Three speeds of 1/50, 1/25, and B. The accessories include the usual camera case, lens shade, and HUGE flash bulb holder that clamps onto the lens -- very similar in appearance to the flash for the Mamiya 16 series of cameras. It is marked "MADE IN OCCUPIED JAPAN". -- (1962) Fixed-focus lens. 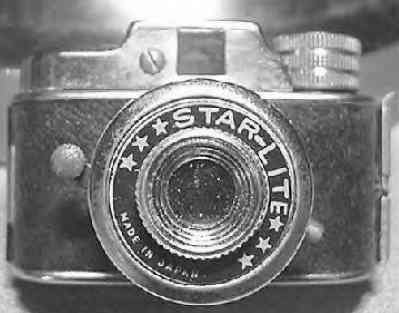 A lighter-type camera, not a Hit-type camera. Speeds of B and I. May have used 8mm film instead of 17.5mm. 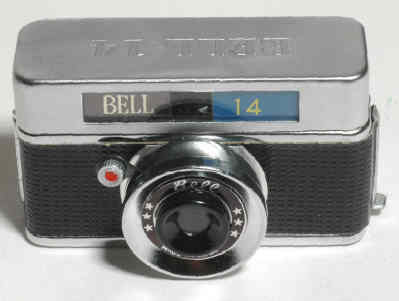 -- an hard to find 17.5mm camera that is shaped more like a mini-Leica than the typical "HIT"-type camera. -- Most of the cameras on this page are referred to as Hit cameras, but they really aren't because their name was not "HIT". But there are actually several types of the original HIT cameras. The first probably appeared around 1950. It has a fixed-focus 30mm lens, a single speed of 1/30, and a fixed aperture of f11.0. 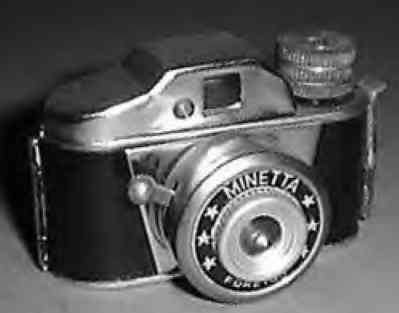 Later versions had slight variations in the front nameplate of the camera, the leatherette color, and some had two shutter speeds -- I (1/25) and B. There was even a "gold" version made. All of the Hits were made by the Tougodo Co., but the Hit look-a-likes were made by other firms and had different names, as you can see. -- it looks so different, it might have been made by a different company. In any case, it is a LOT harder to find the the typical Hit camera. -- (1960) Fixed-focus lens. Single speed. -- Apparently made by the same factory that made the Myracle with similar features, but little is known about it. 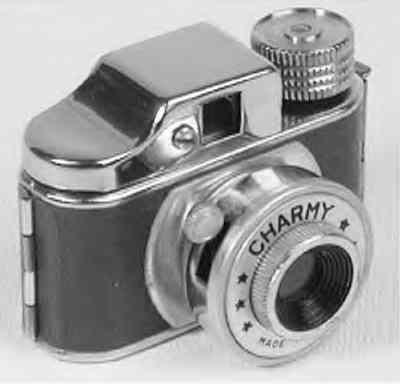 -- (1949) A vertically-styled camera with a fixed-focus 35mm (2.8-11.0) lens. Shutter speeds of B, 1/20 - 1/200. Pop-up viewfinder on the top. -- a "HIT"-type camera. Not to be confused with the Hello Kitty camera which used 110 film. -- (1948) Fixed-focus lens. Speeds of B, 1/25 - 1/100. -- a "HIT"-type camera. Fixed-focus, fixed f-stop lens. Two shutter speeds -- I and B. 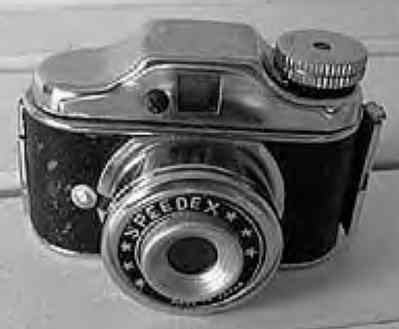 -- (1950) A vertically-styled camera with a fixed-focus 20mm (4.5-8.0) lens. Shutter speeds of B, 1/25 - 1/100. Built-in viewfinder on the top. 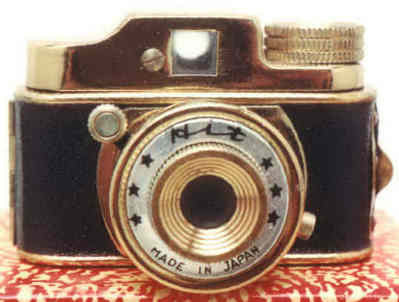 -- a "HIT"-type camera. See also Mighty Midget, and Misuzu Midget. 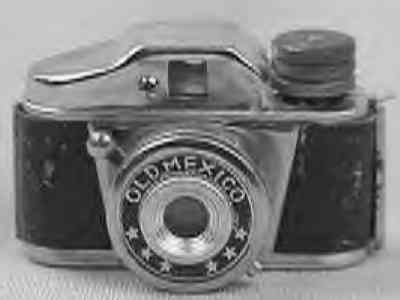 -- (1950) A vertically-styled camera with a fixed-focus lens. Shutter speeds of B, 1/25 - 1/150. Pop-up viewfinder on the top. 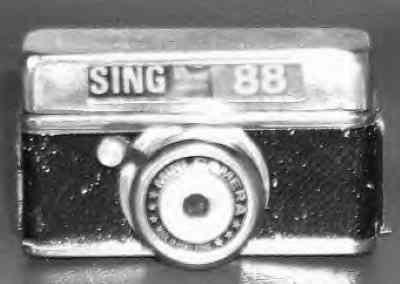 -- a "HIT"-type camera. Fixed-focus, fixed f-stop lens. One shutter speed. It's labeled MINI CAMERA, not just MINI. -- a "HIT"-type camera. It has the name of the U.S. distributor -- SOUTHERN -- on the frontplate. -- (1950) Two models exist. Both have a fixed-focus (f4.5) lens. One model has a variable aperture to f11.0. The other is fixed at f4.5. Both have speeds of B, 1/25 - 1/100. -- (1950) Fixed-focus 14mm (fixed f4.5) lens. Speeds of B and I. 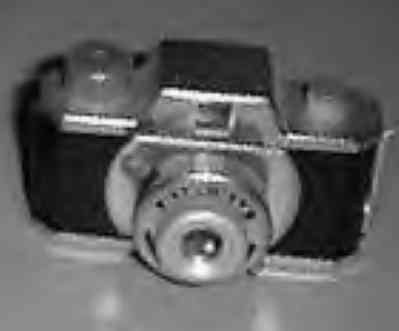 A "HIT"-type camera. Various faceplates. -- (1949) Fixed-focus 20mm lens. Speeds of B and I. Round viewfinder on top. -- (1950) Fixed-focus 20mm (fixed f4.5) lens. Speeds of B and I. Round viewfinder on top. 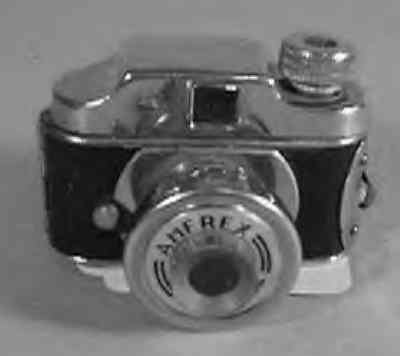 -- (1949) This is a tiny twin lens reflex with pop-up viewfinder. Fixed-focus 20mm (f3.5-11.0) lens. Speeds of B and I. Similar to, but not the same as, the Baby Flex. 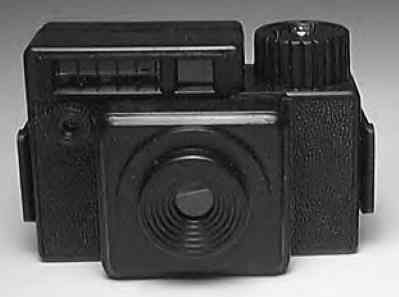 -- (1950) This is a tiny box camera with pop-up sportfinder and regular viewfinder. Fixed-focus (fixed f4.5) lens. Speeds of B and I. -- (1955) Fixed-focus lens with two f-stops marked with images of "clouds" and "sun". Single speed. 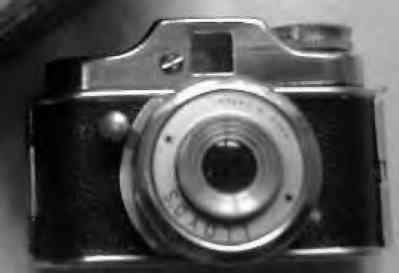 -- (1950) Round camera, sort of like the Petal, but the lens points out the top. Fixed-focus 25mm (f8.0) lens. Speeds of B and I. Pop-up viewfinder on the side. 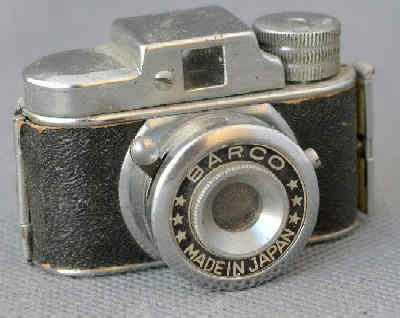 -- (1960) Bar-type camera with fixed-focus (f10.0) lens. Speeds of B and I. It is noteable for its imitation selenium meter and strange 14x16mm format size. -- Did it "REAL"ly exist? 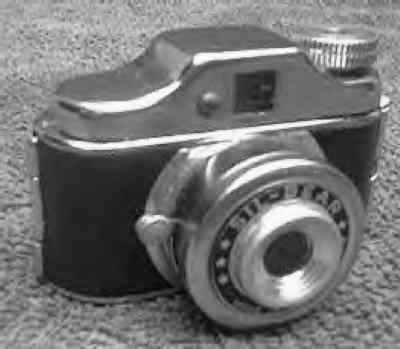 -- (1950) A bar-style camera with a flip-up front cover to protect the lens and viewfinder. Fixed-focus lens. Speeds of 1/50 - 1/100. -- a "HIT"-type camera. Also see New Rocket. -- Shaped like the Snappy, but this one has a unique viewing system. It's actually a tiny TLR camera! Comes with fixed-focus 30mm lens. Speeds of B and I. See Sun B. -- a "HIT"-type camera. Not to be confused with the Sun, it does NOT use 16mm film. -- Not to be confused with the Sun, this is much more like a regular Hit camera. Made by SNK. 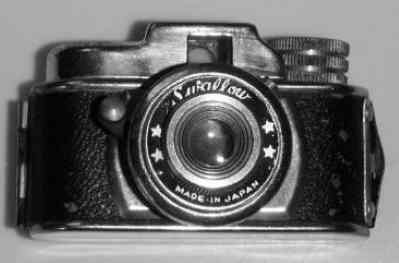 -- There were two cameras that carried the Swallow name, but they are very different in features, even though they are from the same era -- late '40s to the early 50's. The most common is a slightly elongated "HIT"-type camera with the typical features. Two speeds of B and I (1/50) with a fixed-focus, single aperture lens, probably f11. I know it's hard to swallow, but a more upscale Swallow was also made. It had a fixed-focus, 20mm (f4.5-9.0) lens with variable speeds from 1/25 - 1/100, plus B. In addition, it lacked the typical "HIT"-type viewfinder. This model had a waist-level finder. 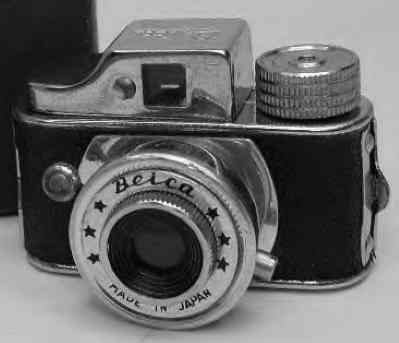 -- (1955) Camera was shaped like a small Leica. Fixed-focus 30mm (f8.0) lens. Speeds of B, 1/25 - 1/100. Flash synch. -- (1950) Fixed-focus 20mm lens. Speeds of B, 1/25 - 1/50. 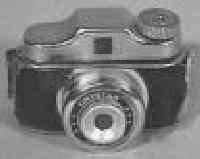 A "HIT"-type camera. -- (1947) 25mm (f4.5-8.0) fixed-focus lens. Speeds of B and I. A "HIT"-type camera with a couple of improvements. First there was the waist-level finder built-in next to the regular viewfinder. In addition, a 2X teleconverter was made which slipped onto the front of the lens.